Have you ever experienced extreme itching and burning on your fingers and hands? If your skin erupts in clusters of tiny blisters filled with clear fluid, it’s possible you have a type of eczema called pompholyx. This is something I have personally been dealing with and trying to make sense of for the last two and a half years, and it seems a fitting subject for my first blog entry on the topic of health and science. About 10 percent of people experience hand eczema, and it has a considerable impact on quality of life. It can be caused by contact with irritant chemicals or allergic reactions to non-irritant substances, and it is often claimed that emotional stress or a history of childhood eczema are key factors. Heat, cold, and sweating are also common triggers. Its impact on quality of life can be due to the centrality of our hands for every aspect of daily living and the extreme inconvenience of available measures to minimise exposure to hazards and to protect sore and itchy skin on fingers and hands. Itching is the number one source of distress, and itching on hands can be particularly harrowing. The physiology of itching is still poorly understood. It is likely that certain chemical (e.g. insect bite) or physical (e.g. wool fibres) stimuli activate itch receptors that cause the brain to interpret the sensation as an itch. One of my personal theories is that the pressure of tense pinpoint pompholyx blisters onto the itch receptors also aggravates the itch. The inevitable scratching makes the skin sore and over-sensitive. Use of steroid creams and ointments leaves skin very dry and even more sensitive. 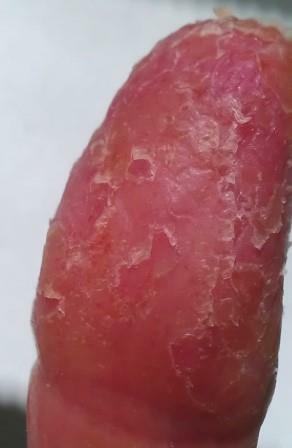 Once the blistering has exhausted itself, the skin often starts to peel off. In my case, this occurred in the areas where the blisters had previously appeared. At the peeling stage, loss of the tough epidermal layer that normally protects hands from wear and tear leaves the skin particularly fragile and vulnerable. 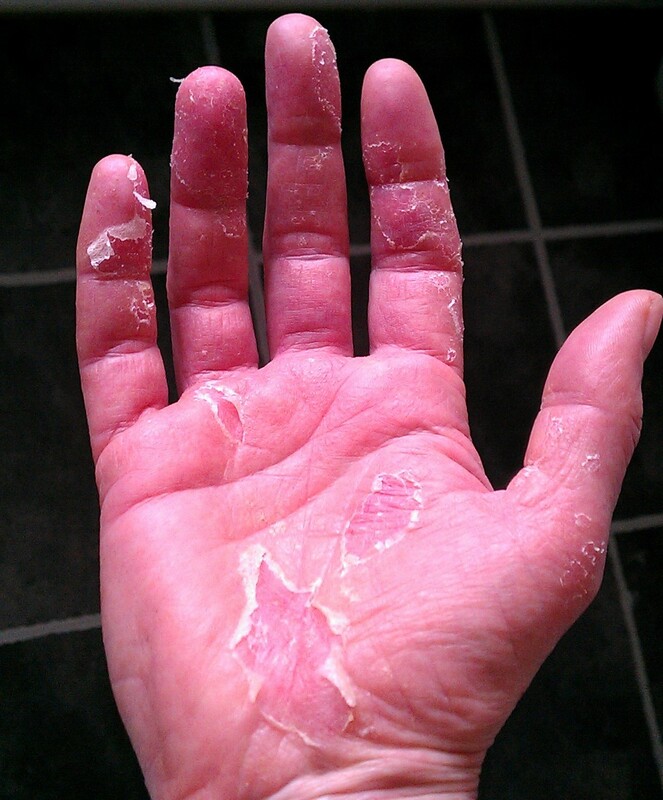 When this first happened to me, I became acutely aware of how I used to take the skin on my palms for granted. Without this layer, I was unable to handle paper without causing my fingertips to bleed from the friction, and all sensations (heat, cold, touch) were magnified and distorted. The epidermis also forms a barrier against micro-organisms. The bacterium Staphylococcus aureus commonly colonises the skin of people with eczema. This bacterial colonisation aggravates eczema. I have had some protracted episodes of skin flaking and erosion as a result. As you can infer from the close-up of my thumb, this state makes normal life impossible. Even the cotton gloves I have come to rely on would get caught up in the rough (and surprisingly sharp) edges of peeling skin. It is important to seek medical advice in case of infection. Extreme cases result in skin breakdown to the extent that the skin becomes ‘raw’ and tissue fluid weeps out. Cotton gloves are frequently recommended for protecting hands when carrying out any tasks that involve coming into contact with irritants. As many of these situations involve getting hands wet, thin vinyl (or PVC) gloves over the top of cotton gloves can provide a waterproof layer. These PVC gloves are not very strong when doing heavy cleaning or gardening jobs, and it is possible to get hold of thick PVC gloves if you have allergies to rubber or latex. I often wear these over the top of cotton + thin PVC gloves, as it makes it easier to slide the thicker gloves on. Finding a soothing emollient cream or ointment and applying frequently is also important. It can be easy to just soldier on and hope the problem will go away, but if it doesn’t, make sure you get medical help. Probably one of the most useful things to consider with persistent hand eczema is to get some patch testing done. Patch testing involves applying a range of known contact allergens to the skin on the back for 48 hours, and then observing for signs of inflammation. In the UK, you will need a referral to a specialist clinic by your GP.